Now there is a cool Superman And His Logo T-Shirt. This black t-shirt shows the famous Superman logo and if you look closer then you can see a dark image of the man of steel standing in front of it. And you can get this cool Superman t-shirt in styles for men, women, and kids and they come in many sizes from tiny babies to adult size 6XL. And if you don’t want a t-shirt then it can be good to know that it is also available as a baby bodysuit and as a hoodie too. Now you can have a Superman shirt that is not to bright and that makes it look really amazing. Now dinner time will be fun for the kids all thanks to this Superman Color It Placemat. This placemat shows a drawing of Superman with his name and famous logo next to it but non of it is colored in but worry not as there are dry erase markers included so that the kids can color it in while eating dinner. And after dinner you can wipe down the Superman placemat so that it is free of food and clean again so that it is ready for the next meal and coloring session. 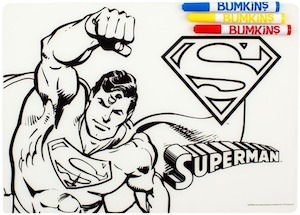 Messy kids or adults that like Superman can now use this placemat and color when they are getting bored of sitting at the dining table. If you like to open a bottle on the go then you should check out this Superman Bottle Opener Key Chain. The metal key chain has the Superman logo S with below it the bottle opener you need for all those bottles. 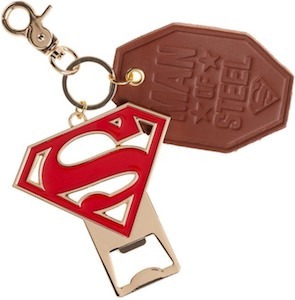 The Superman key chain has a keep loop with a clip and also leather peach that has the text “Man of Steel” on it with the Superman logo below that. So now you can carry your keys in Superman style all thanks to this key chain and having your bottle opener always handy as it will be next to your keys. This Christmas you can be dressed in this Superman Logo And Lights Christmas Sweater. The holiday sweater is Superman blue with on it a banner with trees and snowflakes and there are more snowflakes on the rest of the sweater. On the blue sweater you can find the famous Superman logo in red and yellow and it seems to be entangled in Christmas lights. You can get this super Christmas sweater in men’s sizes Small – 2XL and they are made from 60% cotton and 40% polyester. This year you can’t get an ugly Christmas sweater all because of this sweater that is just amazing looking. Now Superman fans can sleep in style all thanks to this Superman logo duvet cover. The duvet cover is white on the back but the front is what it is all about as it is dark blue in color and has the famous red and yellow logo as used by Supergirl and Superman. You can get this Superman duvet cover in many sizes like Twin, Twin XL, Full, Queen, and King. The duvet cover has a hidden zipper and even some tie down straps inside so that your duvet will sit securely inside it. Now you can sleep under this soft duvet cover and dream about the DC Comics superhero’s. 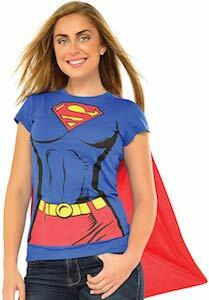 If you want to feel like a female superhero then just wear this Supergirl costume t-shirt with cape. The costume t-shirt is available in many women’s sizes and made from 95% cotton and 5% spandex. The costume t-shirt is blue with chest muscles printed on it and the big red S logo used by Supergirl and Superman and the belt that is part of the costume. And to make this the perfect costume t-shirt they added a red cape that connect with velcro to the t-shirt. So you can be Supergirl this Halloween or if you wanted to maybe even Superman. If you like Superman and traveling then you should check out this Superman suitcase. 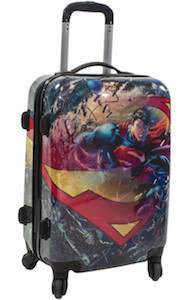 The suitcase is an officially licensed DC Comics product that is covered in the Superman logo and from the logo you can see the Man Of Steel showing up. The hard suitcase is 20 X 14.3 X 9.75 inches and has a retractable handle and 4 wheels so that it is easy to push and pull around. And the Superman suitcase has plenty of room inside as it has dividers there too so that you can organize your clothing and other travel needs when you get ready to travel in Superman style. 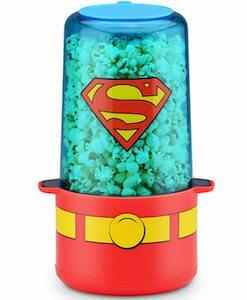 If you like popcorn and superhero’s then you should check out this Supergirl / Superman popcorn maker. The popcorn maker has red base with the Superman belt and then there is the cup on top that is blue and has the Superman logo on it and. The blue compartment is used to make the popcorn and when the popcorn is done you can eat it from the the blue cup. And this Supergirl popcorn maker comes with a scoop for the corn and one for oil. So now you can give up on microwave popcorn and have your own superhero popcorn all thanks to Superman. If you want a cool superhero cap then you should check out this Superman logo cap. The hat is blue but not the normal plain color blue but there seems to be a little bit of white in it and that really makes it look amazing and then on the front it has a big Superman logo on it and that is made from rubber so that it really looks cool in red and yellow on the blue fabric. You can get this Superman cap in different sizes too and it even has the word Superman embroidered in on the back. If you want to start the day in Superman style then you just need to make your morning coffee in this Superman coffee maker. 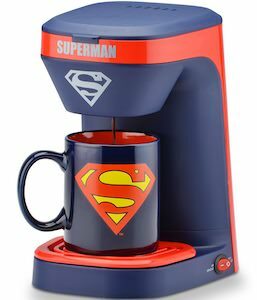 The Superman coffee machine is a single server coffee maker that is blue with red just like the man of steel and it has the Superman logo on it and the word “Superman”. And it is not just making coffee you can do because it includes a Superman mug too so that you can drink your coffee in style. The single serve coffee maker has a permanent filter and removable filter basket so all you need is water and coffee and you are ready to start your day like Superman would.